Freelancing is a dream job for many who want to get rid of the discipline and stress of 9 to 5 job and work in the comfort of their homes. The technology has simplified the opportunity for them and now more and more people are entering this business of their own by using their expertise and talent. The statistics show that more than one third population of USA is working as freelancers while the number increases for the people of EU by 45% in recent years. It is not only easy to work from home but recent studies also reveal that freelancers are earning around 50% more as compared to their employed counterparts in USA and UK. The situation is not different in UAE as well. Upwork is a famous freelancing platform and UAE was ranked 5th in 2014 in Upwork for hiring spend on the platform. The number of freelancers in UAE in 2016 was around 90,000. Freelancing is completely legal in UAE but you have to get the necessary license for this purpose. It is like working as a company with single person. The number of companies turning to freelancers in UAE is increasing with the passage of time and the trend is quite prominent especially in Dubai. But this shift in the increase of number of freelancers can’t be possible without full support from authorities of UAE. Following are the benefits provided to freelancers in UAE that enhances freelancing business opportunities in UAE. Freelancer permit in UAE is available through free zone and also directly from the Department of Economic Development (DED). You will only write your own name in place of company name and the license will be issued within a week. In case of free zone license, you will be charged with zero percent personal and corporate tax and 100% repatriation of your profits which is clearly an advantage. You can easily get freelance permits in the free zones of Fujairah Creative City, Media City and twofour54 in Abu Dhabi. Despite having a personal license, the freelancers can enjoy the benefits of corporate bank accounts. These bank accounts help freelancers to deal in multiple currencies and they can also repatriate 100% of their profits in country of their choice. This is another benefit of starting freelance business in UAE. You don’t require any office space that will reduce the cost of rent with the benefit of working with the comfort of your home. But if you want, you can also rent a desk or office in a free zone. As mentioned above, you can take the freelance permit from free zone also. You don’t need a “no objection certificate” of a local person in free zones and you will be free to start your freelance business without the stress of finding a local sponsor. Freelancers in UAE are allowed to operate in large number and wide variety of fields. In case of taking license from DED, you are allowed to work in all the business activities listed in the DED license. But you are restricted to the business activities allowed in the specific free zone if you are listed to any of these free zones as a freelancer. After meeting the minimum salary requirements, the freelancers have their visas secure after which they are able to sponsor their families or employers (in case of establishing a company). It is important in the sense that freelancing is not a steady job but you can get the opportunity to sponsor your dependents in UAE even with freelancing business. A freelancer doesn’t have to remain alone and they can use the freelancing for establishment of a full fledge company. This is not such a difficult task in UAE as a freelance business license can easily be upgraded to a company license and several free zones don’t require upfront share capital to set up a company. By upgrading your license, you will get the opportunity to apply for multiple visas. 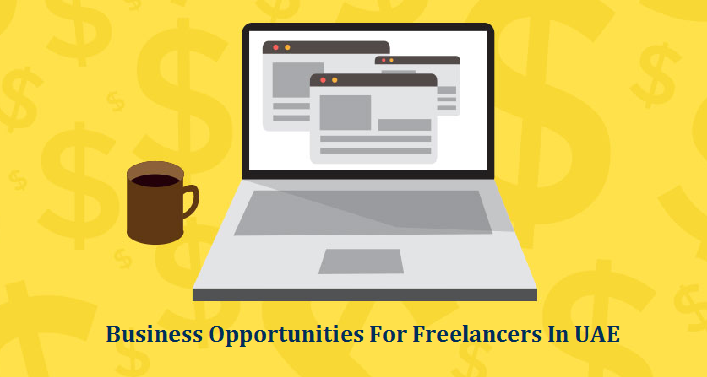 Other opportunities of starting freelance business in UAE include working of a student over 18 as a freelancer and freelance opportunity for a wife with her husband working in a company registered with MOL (ministry of labor). You can get complete information about freelancer visa by call us at : +971 4 5586339 or Whatsapp: +971 56 9971225.